Gosh! Remember these? *BEST PRICE* Teddy Ruxpin $49.52 (Retail $99). Introducing the new 14-inch Teddy Ruxpin animatronic bear. He's totally lovable, and brings magic and friendship to storytime with oodles of interactive technologies and features! 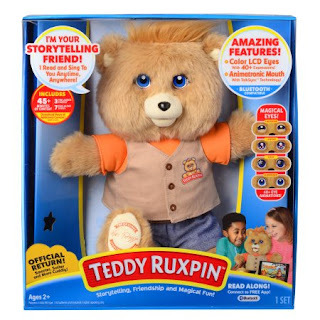 Teddy Ruxpin enjoys telling tales and singing songs with friends ages 2+, making him the perfect companion for both little ones who love hearing stories, as well as older children just starting out on their reading journey. From head to toe, Teddy Ruxpin is embedded with innovative interactive technologies that makes playing and reading with him so thrilling! From color LCD eyes that express a wide range of emotions to a mouth that really moves when he speaks, Teddy Ruxpin takes reading fun to a whole new level. Color LCD eyes with over 40 animations! A motorized mouth that syncs to his speech! Read along with the free Teddy Ruxpin App!